Ordinarily, I’d write this post about how the Septuagint is important, how the reader’s edition will help students of New Testament Greek expand their Koine horizons, and how excited I personally am for this opportunity to explore more Greek. However, Ross and Lanier have been doing a great job covering the first two, so I’m going to focus on the third. I’ve chosen a brief passage to tackle and discuss. (Is this a poorly disguised excuse to read the Septuagint at work? Maybe.) Lest you think I have an advantage from working on this book, let me be clear: I never got to actually read it. The headings, running heads, apparatus, introduction, and glossary, yes. But not the text. In their Q&A, Ross and Lanier suggested the Pentateuch, the Historical Books, and Psalms as ideal places for students of NT Greek to start. I took their advice and picked Numbers 27:1–11: Zelophehad’s Daughters. And before you ask, “Why, Tirzah? Why would you choose such an obscure passage?” let me tell you: it’s because one of the daughters is my namesake, and since I don’t know Hebrew (yet [if I keep saying that, knowledge of Hebrew will come to me in my sleep; I just know it]) this is the closest I can get to reading the passage in its original language. 1. First of all, “Tirzah” is spelled Θερσα. I really thought it would be closer to Τιρζα, and I would love for someone to explain the process of transliterating Hebrew names into Greek. How did this happen? Regardless, I’m excited to see what “Thersa” is up to. 2. The Greek is familiar. Putting aside the vocabulary helps, there’s a lot of familiar stuff here. I’m looking at constructions that I know. A bunch of genitives, many instances of και, a few of κύριος—even a μαρτύριον to remind me of the “witnesses” of the NT. The abundance of proper names will take some getting used to, but that’s the only thing that jumps out at me as a new issue, and most names aren’t essential to the plot. Make no mistake, the apparatus is necessary, but it’s not like every word (or even phrase) is unfamiliar territory. 3. There’s a lot of repetition. You might not remember the word κληρονομία from the NT, but you’ll definitely know that it means “inheritance” by the time you finish reading this pericope. And since I’ve spent a lot of time in the apparatus, I can tell you that it’s pretty common to have several instances of the same rare(ish) word in a passage, which will really help your retention. 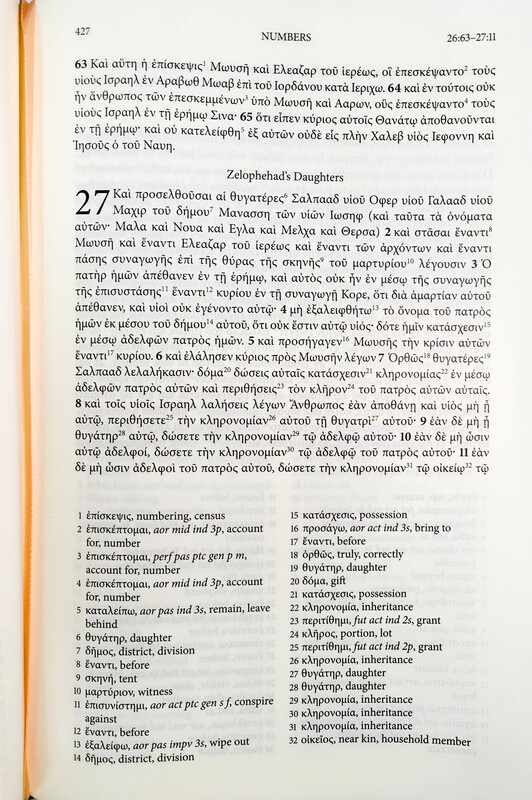 The editors chose to gloss uncommon words the first time they appear in each verse, even when that results in repeated glosses (as you can see above, notes 29–31 are all κληρονομία). That’s great when you’re just dropping in for a verse or two and don’t want to hunt down the nearest gloss. It’s also great when you’re trying to learn the vocab, because the words are reinforced in both the text and the apparatus. 4. You’re never really alone. By this I mean that between the apparatus and the glossary, your vocab needs are covered. If it’s a rare word, it’s in the apparatus. If it’s a common word that you’ve forgotten, it’s in the glossary. If it’s an unusual parsing of a common word, it’s in the apparatus (Lanier and Ross really want you to succeed). You still have to figure out how to put the words together in a way that makes sense, but that’s the fun part. 5. We can read the Septuagint. I know this is the whole point of the reader’s edition and it therefore seems obvious, but the fact remains: pre-reader’s edition, I was never going to pick up the office copy of the Ralphs-Hanhart over my lunch break and start struggling through it. I had no concept of how close LXX Greek was to NT Greek, and no desire to read the LXX with a giant lexicon beside me. I’d heard that the vocab was too different from the NT for me to make the transition, and that was the end of it. Until now. While we were working on this reader’s edition, I knew that it was a big deal, that it would meet an important need. But today, with Septuaginta: A Reader’s Edition in my hands, I know it’s a big deal for me. And probably for you, if you’ve made it to the end of this post. There are more than three thousand beautiful pages of Koine Greek that Ross and Lanier have made available to us in a new way—to be read devotionally or in study, in the context of the Hebrew or the NT, by ourselves or with a group—so that we can better know God and his word. Enjoy them. I know I will. To buy the Septuaginta, visit our website. For more information about Will Ross and Greg Lanier or the Septuaginta (along with a bunch of other really interesting blog posts), check out their blog. She studies genocide! Can I help with that? I have some ideas….